Accidentally became burger queen on twitter which isn't really surprising as I'm out eating burgers almost every weekend but I'm on a mission to find the best London can offer so a lot of research is needed! Last night, along with several of my favourite blogger babes (Lily, Sarah, Sarah, Michelle Aisling, Elodie and Sophie) I went to check out the new pop up FATTburger. 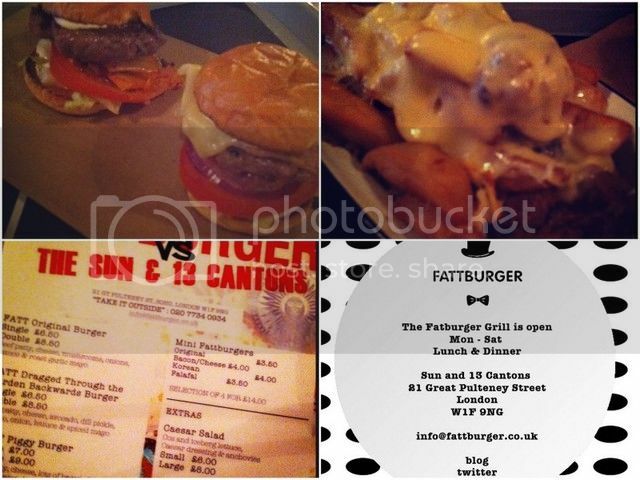 Based in the Sun and 13 Cantons pub in Soho, FATTburger is here until the end of September. As pop ups go the menu is pretty extensive and incredibly reasonable priced. I like the fact everything has a spin as well; for example the original contains mushroom, all burgers have the option of coming as a double and there is even a mini selection available. I wasn't sure what to have so went for 2 mini burgers, chilli cheese fries and onion rings (not shown). The mini bacon/cheese burger was absolutely delicious. Cheese burgers are always a favourite of mine and this was a little slice of heaven. The Korean burger contained kimchi which is a type of pickled lettuce I've never tried before. It was slightly spicy and unusual but an interesting combination and something I would consider trying again in a large version. The chilli cheese fries were unusual, they contained oregano which I've never had in chilli before. At first I thought they were a little strange but the taste definitely grew on me. I also had some onions rings which were totally delicious, they were so crispy and for only £1.50 they are probably the cheapest onions rings you can find in London! All in all I highly rate FATTburger. It's not the best burger I've had so far but it's definitely in my top 10. I definitely want to go back and try a full size one soon! With only a month to go I definitely suggest you get down to FATTburger really soon. I am absolutely starving now! I don't have enough burgers in my life. Must rectify this.